Gyan Ban: Just Beautiful . As the darkness gave way to twilight, the birds got their message to wake up and spread the word. The melody drifted into little Rebecca’s ears. She wasted no time and floated into the courtyard facing the fields. It was to be the last time she would see that view.Rebecca soaked in the early morning summer sun, the only time earth beneath her feet was cool. In a few hours it would heat up the fields as the scorching relentless sun had done for so many months now. The drought in the region had intensified over the last few weeks, crops were dying, and the cattle weakening. Although a small village, generations had thrived, and peacefully existed.. The only source of water was from an offshoot of a river which had slowly reduced to a trickle. More and more people left the village and soon it was time for George & his wife Oviya to leave the village with their only child Rebecca. The decision was tough, the future unknown and insecure. ‘We can’t go on like this any more. We need to head out to the city and find ways and means to keep living. Trust me, this is the right decision’ lamented George. Oviya nodded in agreement. Rebecca in denial. That noon the mercury touched 47C,the sun was beating down every soul and soon a faint trickle snowballed into hoards of people moving out of the place. It seemed the resistance had reached a tipping point. George and Oviya were in the final stages of packing their meager belongings and getting ready to leave. Rebecca stood below the old Mango tree crying softly. She had seen the tree ever since she was born. She had climbed, jumped, swung and eaten Mangoes sweet and sour. ‘I think you should leave little one’ the Mango tree spoke. ‘How can I ? ‘All my life you have been my only friend ,how can I leave you?’ Rebecca retorted. ‘I will be right here waiting for you – go on now’ the Mango tree reassured. Reluctantly, Rebecca went back into the house to get ready to move out of the village with her parents. Just then, there was a commotion outside. The climate was extremely dry. Dry leaves,twigs and trees- a perfect conduit for fire.It was a forest fire. Every tree around them had caught fire. This could block their exit from the village. George had to act quickly. He rushed back to pick up whatever was packed and yelled to Oviya and Rebecca to get out of the house. ‘Where is Rebecca? Oviya screamed. Panic-stricken George screamed from the rear window. Rebecca wasn't hiding there. 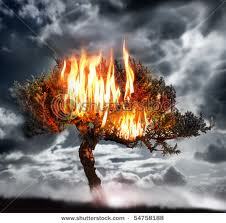 George rushed out to see the old Mango tree burning & little Rebecca near the burning Mango tree. She had an earthen pot in her hand. ‘What are you doing Rebecca, get out of there NOW’ - yelled George running towards her. George saw the small earthen pot she had taken from the kitchen – she sprinkled water on the Mango tree. ‘What are you doing? Do you really think this little water will stop that raging fire? Seeing the little girls plight, the passing God’s beckoned the clouds and rain followed. Gyanban Thoughts - This story is based on the great Kabir's fables.It is about commitment.It is about continuity.It's about going on in spite of adversitites.In the times we live,there are so many alternatives, and choices, that somewhere we stop trying to make things work.In this big world of choices,and better alternatives, sometimes it makes sense to stick to the roots and belive in your efforts and your work - your originality. The beauty is in trying - not giving up.The beauty is in continuity not alternatives,the beauty is in trying to do what you can,rather than wait for the right situation.We all have this beauty within us,just a question of bringing it out. lovely and I mean it, but where's your indivine link? Thanks, appreciate your kind words - added the Indivine link. Frankly speaking I was looking for an inspiration and you simply gave me. I've been trying real hard for something and was almost in a point of giving up when I found your post. Thanks Gyanban! You are so welcome Mr.Pramathesh Borkotoky ! I am glad you did not give up. @Dagny - Thanks I shall wait ! @D2 - Couldn't agree more.Thanks. :-)) Very well written GB. Kabir and his philisophies of life are truly amazing. "The beauty is in trying ........just a question of bringing it out." Beautiful! Towards the end, when Rebecca is standing pouring water to save her only friend, my eyes actually watered....you are such a wonderful writer! You took me to the simplicity of childhood, to a simple story with a moral...Thank you! @Sudeshna - Thanks. You bet. @Nehha - agreed. Thank you. @Tulika Verma - welcome to Gyanban. Am glad you like the story.Actually the true credit goes to Kabir not me.! But thnk you nevertheless. Really nostalgic as well as touching post. I like the line "She had seen the tree ever since she was born" reminds me of a pond in my village at which i used to play 6 years back. End was something like the ad "Tum chalo to hindustan chale"
Do watch this song. I am sure you will love it.